Project Drawdown is the “most comprehensive plan ever proposed to reverse global warming”. According to their website, this initiative “gathered a qualified and diverse group of researchers from around the world to identify, research, and model the 100 most substantive, existing solutions to address climate change. What was uncovered is a path forward that can roll back global warming within thirty years”. By modelling the effects of already existing technology, this group of scientists, activists, and entrepreneurs determined the planets most efficient and successful methods to mitigate global warming. These methods include everything from bioplastics to building with wood, from electric vehicles and mass transit to microbial farming as a way to dramatically reduce fertilizer needs. A big part of implementing project drawndown requires the design of net zero neighbourhoods. 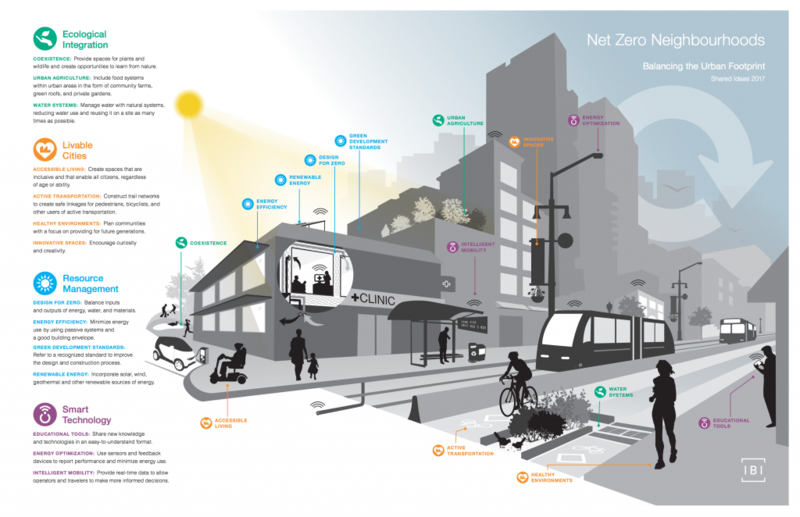 What is Net Zero and how is it related? A Net Zero building is defined by the Canadian Mortgage and Housing Corporation as “[a house] designed and built to reduce household energy needs to a minimum and includes on-site renewable energy systems, so that the house may produce as much energy as it consumes on a yearly basis”. It has most commonly be applied to housing projects, as in the definition above, but any building can be a net zero building if it requires no energy beyond what it produces itself, leaving a net zero overall usage of energy over the course of a year. Some net zero buildings even produce more energy or are able to process neighbouring buildings impacts, contributing a net positive effect on the planet. All of the goals outlined by Project Drawdown can be advanced by designing the built environment to encourage energy and resource efficiency, facilitating renewable energy generation, and incorporating green spaces and urban farming. Net Zero incorporates all of these elements, taking the idea of sustainability one step further to create buildings that don’t just mitigate their impact, but have no negative impact on the environment. IBI Group has recently prepared a Net Zero Neighbourhoods Report to lead the way in designing these neighbourhoods. This report presents strategies for a new approach to city planning and development and advocates for buildings, landscape, and infrastructure that sustainably generate their own material and energy. Our hope is that we will collectively expand this library of shared ideas into a comprehensive list of ways to improve the status quo, helping IBI lead the way to wide-scale changes in the development process, improving the health of people, and the planet. The technologies and systems key to the success of a net-zero system are highlighted in the infographic above. Ecological integration, livable cities, resource management, and smart technology are the key tenants of a net-zero neighbourhood. Just how much of a difference does Passive House construction make? Vancouver put that question to the test this summer. Two tiny homes were constructed, one to BC Building Code standards and one to Passive House standards. Placed inside each home was a 1000kg block of ice. These homes then sat in the summer sun for 18 days. At the end of the challenge, using no additional energy, the Passive House contained 639kg of ice, while the BC Building Code house held only 407kg. This concept doesn’t only apply to single family homes. There is currently an 85-unit Passive House apartment building being developed in Vancouver. Integrating both net zero and passive house technologies are key to success at Project Drawdown. What challenges are still holding us back from constructing these sustainable developments?